Latest cordless drill sale, offers and promo codes both online and in-store from retailers across the UK. Looking for a cordless drill sale to tackle different tasks around your house or workshop while still staying on your budget? Or you just simply want to complete your workstation tools? Here at Latest Deals you’ll find some of the best drill offers, sales, discount codes and voucher codes from big retailers like Argos, Toolstation, Screwfix, Wickes, B&Q and more! If you’re searching for a cordless drill in the market but can’t decide which one to get, this helpful and useful buying guide we’ve put will surely help you narrow down your choices. We also know that savings is on the top of your list and that’s one thing that you don’t have to worry about as well. Here at Latest Deals our massive community of bargain hunters are always on the lookout to find the best possible deals around to post and share. Here you will find everything from cordless drill sale to combination drill offers, accessories and more that will give you amazing savings! Drills come in a wide array of choices costing ranging from £50 to £300 and even more, so it is important to carefully think first on where you’re going to use it to narrow down your choices before buying one. A Drill’s main purpose is drilling holes, but there are additional features like variable gears and speeds as well as hammer action that can make you do so much more with it. Choosing the best drill to meet your needs can be somewhat frustrating and confusing. Aside from a huge variety to choose from, there are brands that bombards shoppers with numerous features and benefits, bigger capacities, torque ratings and higher speed, as well as the latest cordless batteries. Drills can either be corded or cordless. Corded drills are reliable, lightweight and powerful with chucks available in variable sizes. They are intended to use for more intensive tasks. It is best for a site or workshop wired with electricity. It can be used for a various tasks like drilling through hard concrete or soft wood and even for a simple task like mixing paint. However, that additional power comes with additional weight as well. In addition, it can be hard to control because of the cord that can limit your mobility unless you’re an experienced handyman. On the other hand, cordless drills are more versatile and convenient. You can use it for drilling holes and for loosening or tightening screws. Most of the time its chucks are between 10mm to 13mm. Keep in mind that your drill will be easier to use the greater power it has. It’s also important to match your drill’s power with your own physical strength. You may lose control of your drill and increase the risk of injury if you can’t handle its power. Drill or drivers. Combining high speed rotary drilling with screw driving, these type are the most popular. These are ideal for most of your DIY jobs in your home. This cordless drill comes with a set of speeds for use as a screwdriver, making it a very handy tool. On the downside, it does not come with a hammer action. Combination. This type combines, hammer drilling, high speed drilling and can also be used as a screwdriver. It also combines the screwdriving and rotary elements like most cordless drills. The hammer element basically means that you can use this drill on tougher surfaces and materials like concrete, brick and cement. Rotary drilling is your drill’s speed or range of speeds. In layman’s terms, it’s how fast the drill’s chuck will spin around. It is ideal for your tool to come with different speeds in order to drill into various types of materials. It is a good idea to opt for a cordless drill that comes with variable speed. Meanwhile, the hammer drilling function is used to easily drill through materials such as brick, mortar, concrete, block or stone. You won’t need this function for drilling steel, wood or metal. This function bumps and down really fast mimicking a hammering function that helps break harder materials. Where can I find a cordless drill sale? 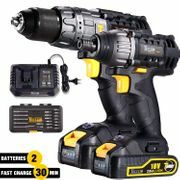 Cordless drill B&Q: If you’re looking for portable and powerful 18V cordless drill deals, B&Q offers the Ryobi One+ cordless 18V drill driver without batteries for just £50 with free delivery and 45 days return policy. Cordless drill Screwfix: Screwfix offers a wide range of cordless drills from Makita, Bosch, Dewalt and Hitachi. Lookout for their “Price Drop” tag where you can get a savings of 6-11% on select brands and models. Cordless drill Argos: If you’re on a really tight budget, look out for Argos clearance where you can get great deals on select cordless drills. You can even save as much as £68.89 on some drills and they have a wide selection of different cordless drills with a price tag of less than £50 plus they come with 2 years guarantee. 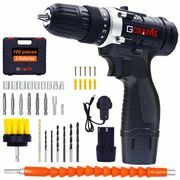 Cordless drill Toolstation: Toolstation offers a wide range of cordless drill 18v and other models with free shipping, but these are more high-end models. 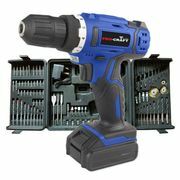 Wickes cordless drill: You can get up to 33% off at Wickes on their own select cordless drill models. You can get a Wickes cordless drill and combi drill and for just £59.99 plus free delivery. Power. As mentioned above, the more power your drill have, the easier it would be to drill through more resistant materials. Make sure to match its power to your own power to avoid any unnecessary injuries. Chuck type. You can find this at end of the drill where you insert the drill bits, screw attachments and all other accessories. Its types include standard chuck, self-tightening chuck and sds chuck. Percussion. This feature facilitates drilling through materials that are really hard, strong or dense. Most drills with this function can be turned on or off by just pressing a button, while some can be found on the drill motor itself. Its speed is determined by the drills strike rate usually between 35,000-50,000 strokes Look for a drill with a strike rate of at least 43,000 stokes per minute for best results. Rotation speed. This is the drill head’s speed as well as any bits held by its chuck and speed is expressed in rpm. Drill’s speed on the market today is typically between 800-2,000rpm. Higher speed means better quality drills and its efficacy on hard materials will increase. Clutch and stop-strike. The clutch is a cordless drill’s safety feature. It disengages the chuck as well as the drill head from its motor in case of a jam or blockage of the screw head, drill bit or holesaw. It will also protect you by decreasing any risk of injury.